Dungeons & Dragons Players Converge on PAX Unplugged - Live performances by Dice, Camera, Action!, Critical Role, Acquisitions Inc. The panel line-up for PAX Unplugged 2017, the inaugural tabletop-focused PAX event, will feature Penny Arcade's Acquisitions Inc., Geek & Sundry's Critical Role, and Wizards of the Coast's Dice, Camera, Action. Fans unable to join the weekend long celebration of tabletop culture,taking place Nov. 17-19 at the Pennsylvania Convention Center, can watch the action live on Twitch. Boasting the longest-running show on Dungeons & Dragons' Twitch channel, Dice, Camera, Action! LIVE at PAX Unplugged will see Wizards of the Coast's resident Dungeon Master, Chris Perkins take Holly Conrad, Jared Knaubenbaur, Anna Prosser Robinson, Nathan Sharp, and an unannounced special guest, deeper into the jungles of the Chult on Friday, Nov. 17, 8:30pm -11:30pm at the main stage. Geek Sundry's Critical Role cast, featuring creator Matthew Mercer, actress Marisha Ray, and renowned voice actors Liam O'Brien and Taliesin Jaffe, take the main stage for Critical Role: Talks Machina on Saturday, Nov. 18, from 4pm - 5:50pm. The team will dive into the past adventures of Vox Machina, what may be in store for the next campaign and answer questions from fans. 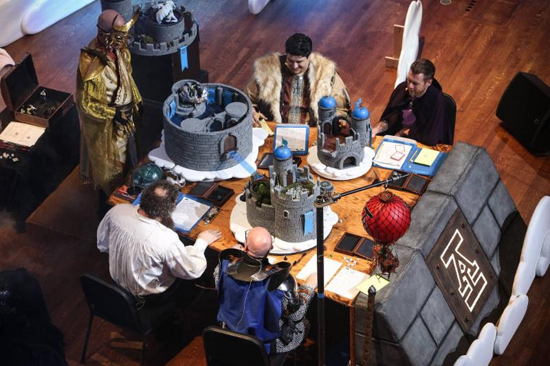 Previously enjoyed by tens of thousands at PAX West and PAX East, Penny Arcade's live-performance Dungeons & Dragons game, Acquisitions Inc.: The Series will take the main stage on Saturday, Nov. 18 from 8:30pm - 11:30pm. Featuring Penny Arcade and PAX co-founders Mike Krahulik and Jerry Holkins, The Kingkiller Chronicle's author Patrick Rothfuss as Viari, and special guest star Kate Welch as Rosie Beestinger, Acquisitions Inc. LIVE at PAX Unplugged will also feature Wizards of the Coast's Chris Perkins reprising his role as Dungeon Master. Debuting for the time at a PAX, Acquisitions Inc.: "C" Team LIVE at PAX Unplugged will feature Penny Arcade's Acquisitions Inc. spinoff '"C" Team.' Join industry personalities Amy Falcone, Kris Straub, Kate Welch, Ryan Hartman, and Penny Arcade and PAX co-founder Jerry Holkins, as they fumble through a special one-off game in which a total party kill is almost certain, Sunday, Nov. 19, 11am - 2pm on the main stage. Tickets for PAX Unplugged 2017 are currently on sale via the official registration page. Three-Day Tickets are $60 USD while Friday Only, Saturday Only, and Sunday Only Tickets are $25 USD. Sunday Kids Day Tickets (for children age 6-12) are also available for $10 USD. Part of Penny Arcade's international roster of events, which also include West, East, South, and Australia, PAX Unplugged is a hybrid of digital and analog tabletop gaming, giving card and board game enthusiasts a dedicated event to celebrate their rich and thriving culture. Reflecting the experience millions of PAX attendees have enjoyed for more than a decade, visitors will have the opportunity to see the reveal of new and exciting titles, go hands-on with upcoming games, partake in tournaments and sit-in on panels headlined by the industry's leading minds.